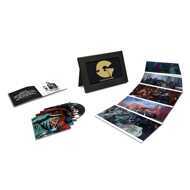 Liquid Swords is the critically acclaimed album from Wu-Tang member GZA. “Liquid Swords: The Singles Collection” highlights the standout singles from the album (I Got Ya Back, Liquid Swords, Cold World, 4th Chamber/ Shadowboxing) by placing them on 7” vinyl and pairing each one with a custom 15.75” X 10.25” high end art print, illustrated by Andrew Hem. All of which are housed in a sleek oversized art box with a unique easel back and clear display window.